Delphi Firemonkey forms are built and rendered internally using OpenGL on mobile devices like Android and IOS. This gives you easy access to other 3D features like applying filters to an image. Delphi ships with a large set of image filter components which you can easily use in an image editing application or just to spice up your forms. Want to build an app like Instagram or Photogrid with Delphi Firemonkey for Android? No problem. Delphi XE5 ships with the filter effect components that make this easily possible. There are literally over 60 different effect filter for you to choose from right out of the box with Delphi XE5. Be sure to check out the other post where you find out how to apply the filter effects with code to controls which are not visible. There are even transition effects included which can be animated. You can also write your own filters. Before to check out the ShaderFilters demo app at the very bottom of the page after the jump. 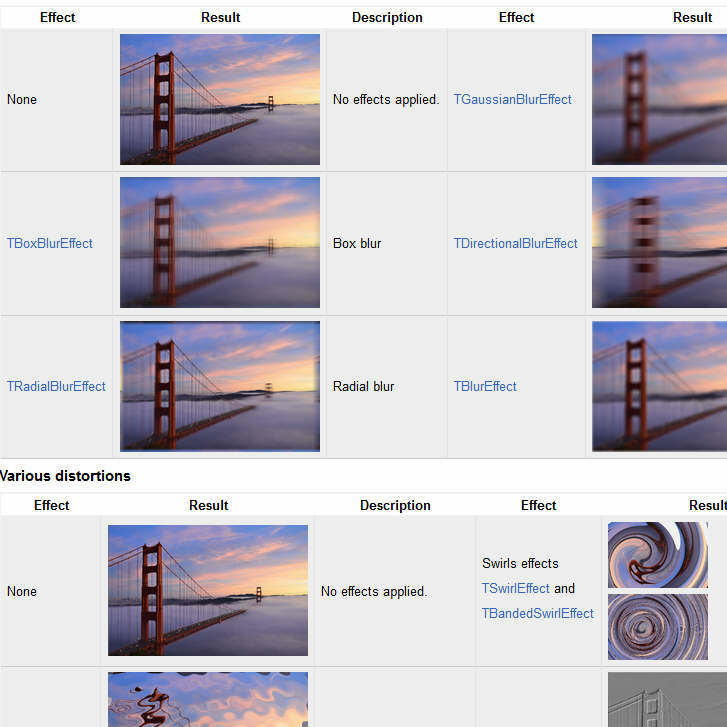 Head over and check out examples of all the filter effects in action from Embarcadero.